The BTC/USD (Bitcoin) has finally broken clear through the key level of $4,000 after a string of positive news from the market. Bitcoin had found it hard to reach the $4,000 level in the last couple of weeks, but this week has come bearing gifts for crypto traders with cryptocurrency prices of top cryptos rebounding across the board. The price of bitcoin hit a new multi-week high on Sunday when it monetarily traded at $4,166 before closing the day at $4,102. This week news emerged that two multi-billion dollar retailers had started accepting bitcoin as a payment method on their platforms. Avent, a leading technology solutions provider based in the US announced that it will begin accepted bitcoin and Bitcoin Cash (BCH) as a method of payment. This came after Switzerland’s largest e-commerce company Digitech Galactus AG greenlighted the use of Bitcoin, Bitcoin Cash, Ethereum (ETH), and Ripple (XRP) among other altcoins for use in their platform. Such news of more online retailers accepting cryptocurrencies are boosting crypto prices and bitcoin is set to soar higher. 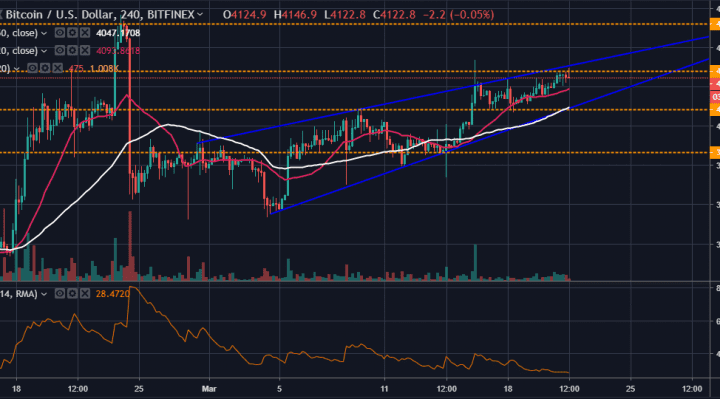 From a technical perspective bitcoin, BTC/USD appears to be trading within an ascending channel and recently bounced off the support baseline. It now seems to be targeting the $4,147-$4,150 range for the next pullback amid strong resistance. If BTC/USD continues to trade within this channel, then $4,160 becomes a realistic target by the end of the week. As such, the bulls will be looking at $4,147 through $4,150 for short-term profits while the bears will hope for an immediate pullback towards the $4,109 level. 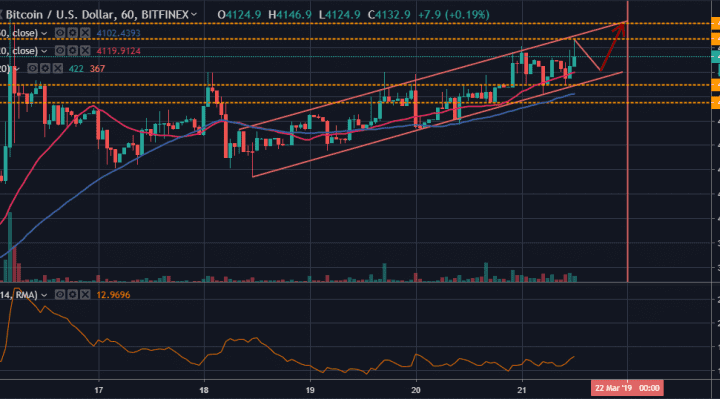 In the 240-min chart, the price of Bitcoin appears to be trading within a tightening ascending wedge, which suggests that a bullish consolidation could be beginning to form at the top of the channel. This could signal a major reversal in the next few weeks if not days, but for now, the bulls appear to be in control as BTC trades above the 20-period and the 50-period moving average lines. In summary, the price of Bitcoin has rallied over the last few trading sessions to break through the $4,000 level. It now looks to target levels above the $4,100 for a new trading range. February highs are now in site.